Los Alamos in Sewerby, near Bridlington, Yorkshire sleeps 5 people. Los Alamos near Bridlington is a great family holiday home which is situated near the village of Sewerby and only 3 miles from Bridlington. It is a very spacious end-terrace cottage with a lovely large conservatory overlooking the rear enclosed garden. The local pub is just a stone’s throw away and is very popular for good local food. The wonderful Sewerby Hall is within walking distance with its stunning gardens and a small zoo for the children. The stately home is a beautiful Edwardian residence that overlooks the sea and is renowned for providing great entertainment for the children with themed activities and the chance to dress in Edwardian clothes. Lots of visitors have picnics in the beautiful grounds before catching the land train down into Bridlington or take a leisurely walk along the clifftops. Danes Dyke Nature Reserve is a short stroll from the cottage with lots of wonderful walks to enjoy. Los Alamos is also a great base to visit the east coast. Flamborough Head, with its chalk cliffs, is an attraction for bird watchers where migrating birds cling to the cliff edges. The puffins are very popular at Bempton Cliffs. 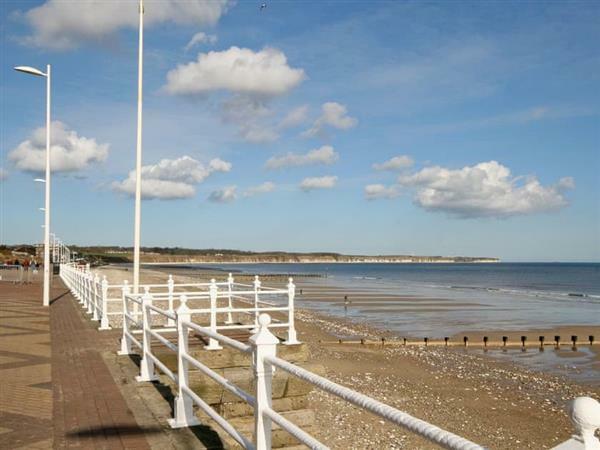 The seaside resorts of Filey and Scarborough are a short drive from the property, and both have fantastic beaches and something to please everyone. The town of Bridlington is still a very busy working harbour, and has many family attractions close by. There’s a great indoor leisure centre where you can have a go on the climbing walls or have a swim or fun in the splash pool. Bridlington Spa puts some great shows on throughout the year with international acts. The beach is 3 miles from Los Alamos near Bridlington. With the shop 400 yards, and the pub & restaurant are 150 yards from Los Alamos. Living/dining room: With electric fire and 50 Freeview TV. Kitchen: With gas range, microwave, fridge/freezer, washing machine and wooden floor. Conservatory: With 42 Freeview TV. Bedroom 3: With single cabin bed. Gas central heating, gas, electricity, bed linen, towels and Wi-Fi included. Travel cot, highchair and stairgate available on request. Welcome pack. Enclosed lawned garden with sitting-out area and garden furniture. 1 small dog welcome. Private parking for 2 cars. No smoking. Please note: There is a covered pond in the garden, 5 yards away. Holidays at Los Alamos run from Friday to Friday. Pets allowed at Los Alamos. For a better idea of where Los Alamos is, you can see Los Alamos on the map below. Los Alamos is in North Humberside; should you be on the lookout for a special offer, you can find all the special offers in North Humberside. It's always worth checking to see what is on offer at the moment. Do you want to holiday near Los Alamos (UK10389), you can see other cottages within 25 miles of Los Alamos; have a look to find your perfect holiday location.